The world got another glimpse of Prince William and Princess Kate's youngest child, Prince Louis, today at his christening. 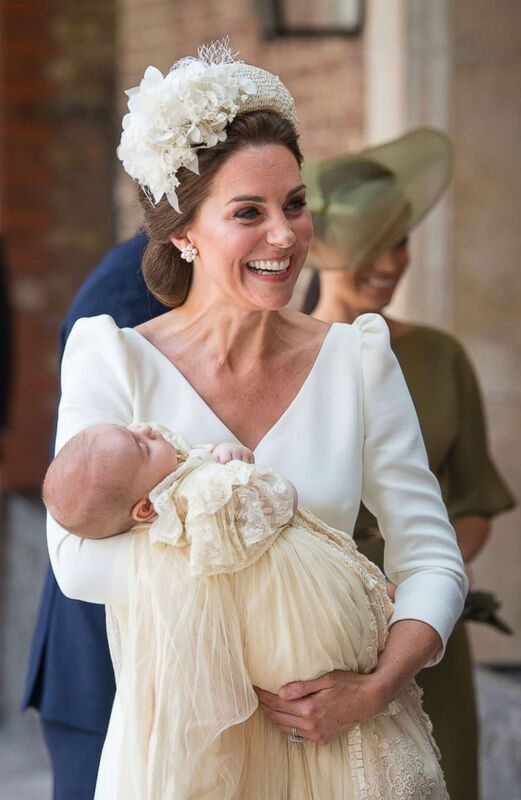 Princess Kate carried two-month-old Louis, dressed in a christening gown with a long royal history, into the Chapel Royal at St. James's Palace. Princess Charlotte and Prince George hold the hands of their father Prince William while Kate, Duchess of Cambridge holds Prince Louis as they arrive for his christening service at the Chapel Royal, St James's Palace, London, July 9, 2018. 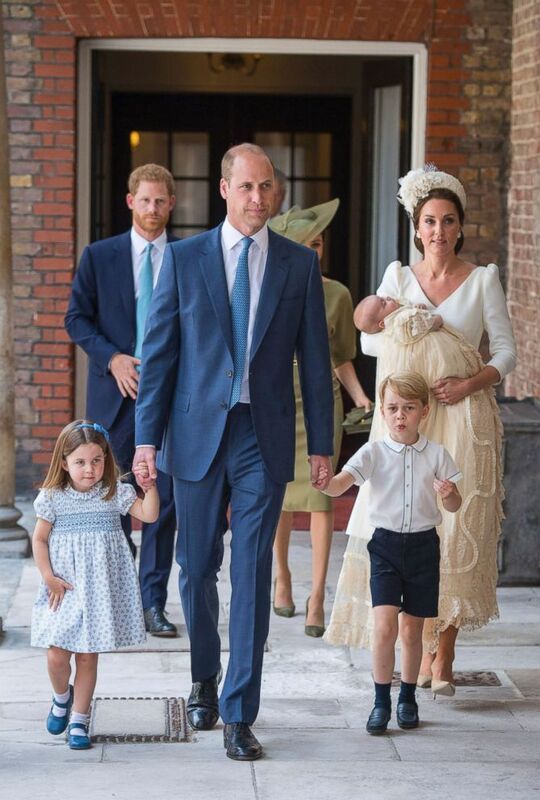 Prince William held the hands of Louis' siblings, Prince George, who turns 5 this month, and Princess Charlotte, 3, as they entered the chapel. 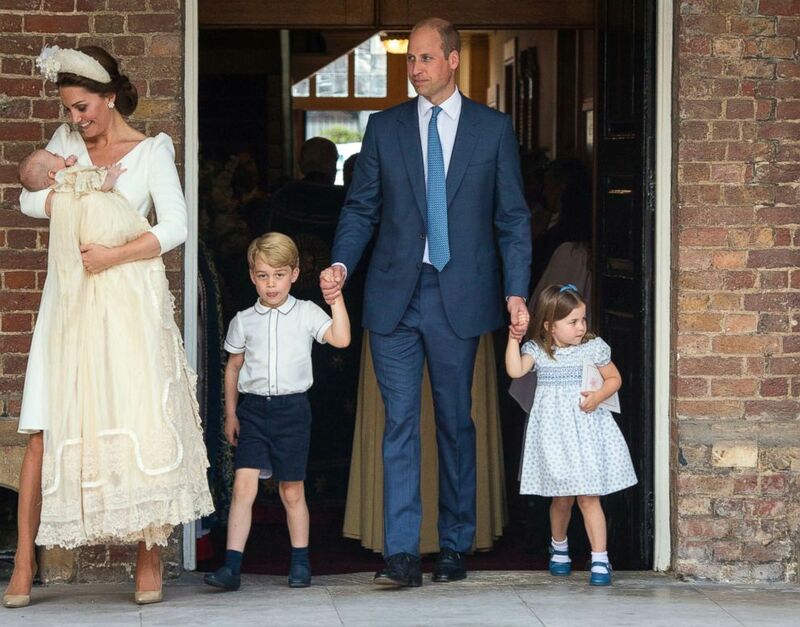 George and Charlotte shook hands with church leaders as they entered the chapel and Charlotte even gave a little wave, an adorable move she is quickly becoming known for at public events. The family also entered the Chapel Royal with Prince Charles and Camilla, the Duchess of Cornwall, and Prince Harry and Meghan Markle, the Duke and Duchess of Sussex. The Duchess of Cambridge wore a dress by McQueen, the same designer she's worn for each of her children's christenings, and a hat by Jane Taylor. Kate, Duchess of Cambridge carries Prince Louis as they arrive for his christening service at the Chapel Royal, St James's Palace, London, July 9, 2018. 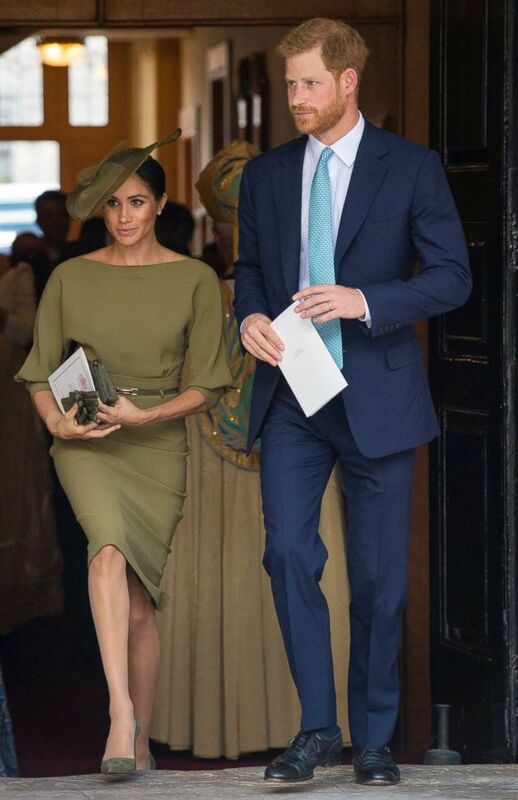 Duchess Meghan chose an olive Ralph Lauren dress and a hat by Stephen Jones for the christening, her first as a member of the royal family. The Duchess of Cornwall wore a Fiona Clare dress and Locke hat. Louis great-grandparents, Queen Elizabeth and Prince Philip, are not attending the christening. The monarch had a busy week last week in Holyrood in Scotland and will be busy this week attending the RAF centenary Tuesday with other members of the royal family. Later this week, she will host President Donald Trump for a meeting at Windsor Castle. The Queen has spent the weekend at Sandringham, her country home in Norfolk, and is traveling back to London today. William and Kate were aware of Queen Elizabeth’s busy schedule several weeks ago. In addition to the royal family, members of Kate's family -- her parents, Michael and Carole, brother, James, and sister, Pippa -- are also attending the christening. Kate's younger sister, Pippa Middleton, is pregnant with her first child with her husband, James Matthews. The Archbishop of Canterbury, the Most Rev. Justin Welby, is presiding over Louis's christening, just as he did for George and Charlotte's christenings. Kate, Duchess of Cambridge speaks to Archbishop of Canterbury Justin Welby as she arrives carrying Prince Louis for his christening service at the Chapel Royal, St James's Palace, London, July 9, 2018. 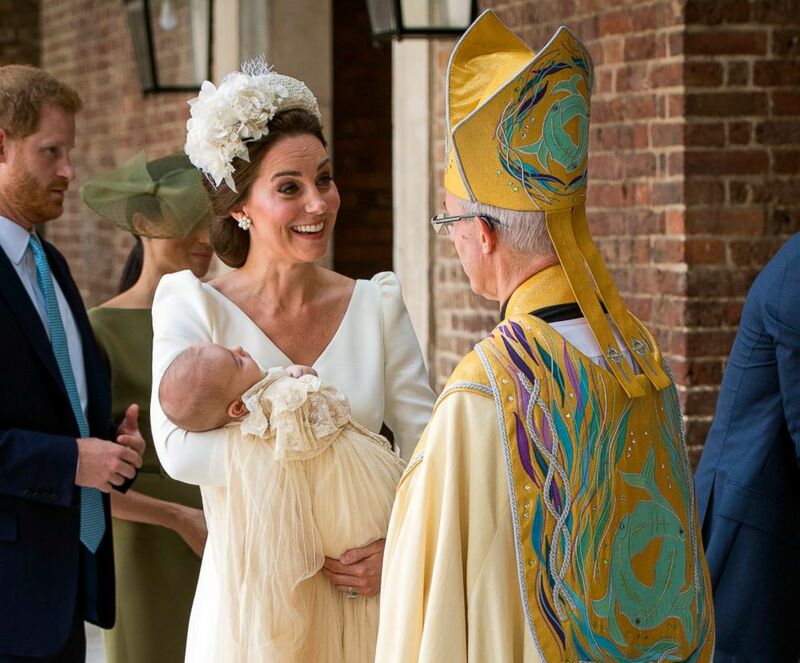 Welby also presided over the baptism and confirmation of Louis's new aunt, Duchess Meghan, in March, which also took place at the Chapel Royal, where Prince George was also christened. Prince Louis is the fifth in line to the British throne. William and Kate asked six friends and family members to be Louis's godparents. The godparents and their spouses were seen arriving at the Chapel Royal prior to the royal family. Mr. Nicholas van Cutsem is one of William and Harry's oldest friends. His daughter, Grace van Cutsem, famously stole the show at William and Kate's 2011 wedding when she covered her ears on the balcony of Buckingham Palace. Van Cutsem's father was one of Prince Charles's closest friends. His brother, William van Cutsem, is Prince George's godfather. Mr. Guy Pelly is one of William and Harry’s closest childhood friends. He helped organize William's bachelor party and is married to an American, Holiday Inn heiress Lizzie Wilson. Pelly is the son of Princess Diana’s close friend Lady Caroly Herbert. Mr. Harry Aubrey-Fletcher attended both Ludgrove prep school and Eton with William. The Lady Laura Meade is married to James Meade, also one of William's oldest friends. William was an usher in their wedding and James Meade is godfather to Princess Charlotte. Mrs. Robert Carter, Sophie, is one of Kate's closest friends and also shares the honor of being one of the few friends in William and Kate's inner circle who is godparent to two of the Duke and Duchess of Cambridge’s children. She is also godmother to Princess Charlotte. Miss Lucy Middleton is cousin of Princess Kate who spent her gap year in Florence with the Duchess of Cambridge. 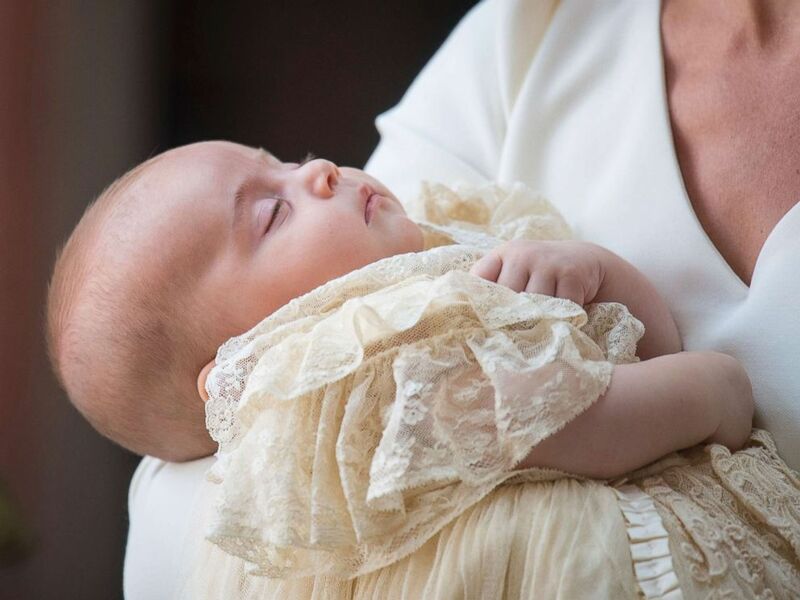 His Royal Highness Prince Louis Arthur Charles of Cambridge will follow in his brother and sister’s footsteps by wearing a christening gown used for every generation of royal infants. Duchess of Cambridge, Kate and Britain's Prince William with their children Prince George, Princess Charlotte and Prince Louis as they arrive for Prince Louis' christening service at the Chapel Royal, St James's Palace, London, July 9, 2018. The gown, remade in 2008 by Queen Elizabeth's dresser, Angela Kelly, is an exact replica of the gown first commissioned by Queen Victoria 174 years ago. The Lily Font is another piece of royal history present at Louis's christening. The Font, said to weigh 21 pounds has been used at the christenings of all royal family newborns since Queen Victoria and Prince Albert commissioned it before the birth of their first child in 1840. Water from the River Jordan will be used during the baptism. After the christening, William and Kate hosted a private tea at Clarence House. The christening cake served at the tea is a tier taken from William and Kate's eight-tier wedding cake. Monday's christening is the first time Louis has made an official public appearance since his parents, William and Kate, debuted him outside of St. Mary's Hospital in London just hours after his birth. 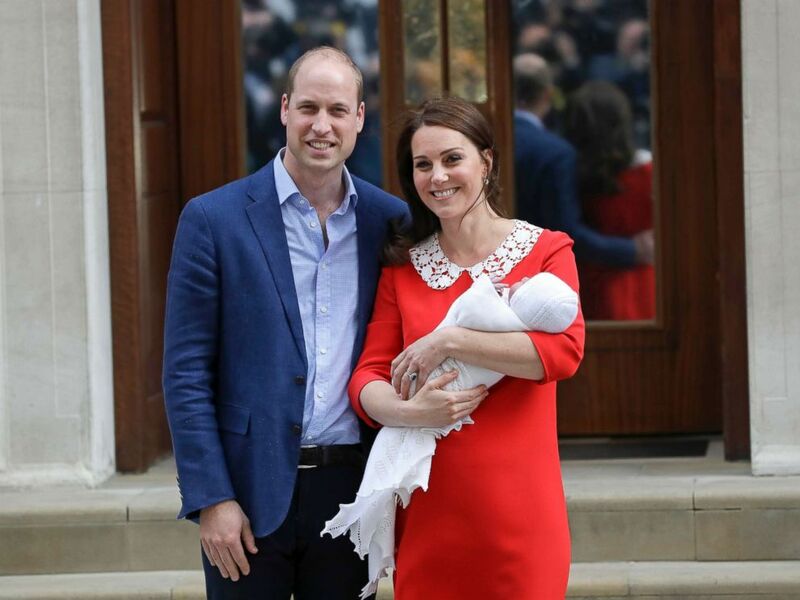 Britain's Prince William and Kate, Duchess of Cambridge pose for a photo with their newborn baby son as they leave the Lindo wing at St Mary's Hospital in London, April 23, 2018. Louis was not present when Kate, William, George and Charlotte attended Meghan and Harry's wedding at St. George's Chapel just three weeks after Louis's birth. The family also appeared together at Trooping the Colour in June without Louis, who was younger than 2 months old at the time.